Traditionally made using free range eggs and beef dripping for a light, crisp texture. INGREDIENTS: Wheat Flour (Wheat Flour, Calcium Carbonate, Iron, Niacin, Thiamin), Skimmed Milk, Egg White, Egg, Beef Dripping (3%), Rapeseed Oil, Salt, Emulsifier (Sunflower Lecithins). Keep refrigerated., This product may have been previously frozen and has been restored to chill temperature under carefully controlled conditions., Defrosted: It is still suitable for home freezing. Instructions: Remove all packaging. From chilled: 200°C/Fan180°C/Gas 6 4-5 mins Place on a baking tray in the centre of a pre-heated oven. Instructions: Remove all packaging. From frozen: 200°C/Fan180°C/Gas 6 5-6 mins Place on a baking tray in the centre of a pre-heated oven. 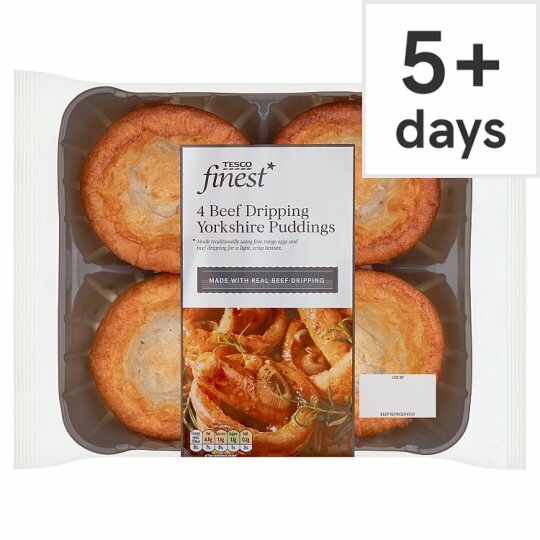 Ideally freeze as soon as possible after purchase but always by "use by" date shown.